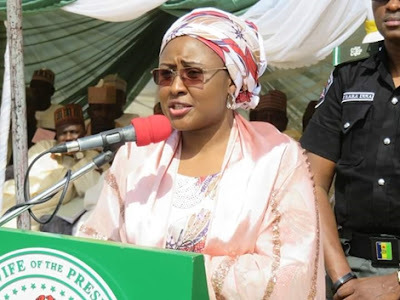 Aisha Buhari, the wife of President Muhammadu Buhari, has once again, shared a post on social media that seems to be criticizing the her husband's government. It was reported on Friday that the Inspector General of Police, said only 20% of policemen are engaged in securing lives and properties of Nigerians while the remaining 80% are providing personal security for prominent people. The IGP's comments were trailed with criticisms and mixed reactions from Nigerians with most people criticizing the current Buhari-led federal government. It will be recalled that Mrs Buhari had last month retweeted a video of a lawmaker raining heavy criticisms on her husband's ruling style. "Repost @oaktvonline 80% of Nigerian police officers provide personal security for ‘prominent people’, AIG laments . The Assistant Inspector-General of Police (AIG), Zone 5, Rasheed Akintunde, says only 20 per cent of policemen are engaged in protecting lives and ensuring peace in the country. “The remaining 80 per cent are just busy providing personal security to some `prominent people’ on guard duties. Mr. Akintunde said this on Thursday while addressing officers and men of the Police Headquarters in Bayelsa, during his tour. “Honourable members want police security, even Reverend Fathers, Bishops now want police security, so the remaining 20 per cent police the whole country. “If we can redistribute policemen from some government formations and deploy them to work ."